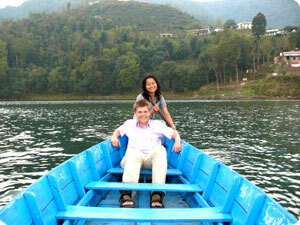 The Himalayan kingdom of Nepal is the best destination for the Honeymoon package trip. If you are just engaged and looking for a Honeymoon package trip probably Nepal is an idea place for unforgettable lifetime experience. Nepal is not only known for land of colorful cultures, ancient history, legendary of Sherpas and world's tallest mountains but also a popular destination for honeymoon trip for couples relaxing Honeymoon trip in Nepal Himalaya, Honeymoon tour with wildlife adventure, Nepal honeymoon tour with nature excursion. Himalaya Journey Treks & Expedition offer for numerous spouse fabulous Honeymoon tour in Nepal after they get engaged. Himalaya Journey trekking professional will create unique Nepal Honeymoon tour to explore around the colorful cultures and ancient history, the most romantic, breathtaking sceneries, unforgettable moments with Nepal wildlife and floral forests, razing rivers and the breathtaking view of the majestic Himalayas entire their honeymoon trip in Nepal. Our team of experienced guides helps you to make your honey moon vacation more enjoyable and memorable in every corner of the Nepal honeymoon tour. Himalaya Journey Trekking and Expedition‘s tour operator manage the adventure honeymoon package trip where the couples enjoy much and feel comfortable while they prefer for Nepal honeymoon adventure tours. HJT generate Nepal honeymoon tour not only in valley beside that Nepal Himalaya trekking honeymoon trip is the more fantastic and unforgettable. Nepal Himalaya honeymoon trip can be done in all Nepal trekking region but as standpoint of relaxing only less then 4000m such as Everest view honeymoon trip in Everest region, Annapurna balcony honey trip in Annapurna region, Langtang valley honeymoon trekking will be applicable for couples. The hardest part is choosing one out of the many for honeymoon package tour but. No matter what your preferences are, you will likely find the best honeymoon package in Nepal that suits you and your new spouse for more enjoyable .HJT arrange Nepal Honeymoon tour probably most romantic, breathtaking scenery in the world.